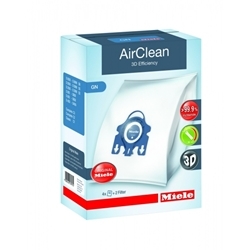 Fits all Miele Vacuums that use type G or N Vacuum Cleaner Bags. The 9 stage layered special fabric of this dustbag has many advantages and is ideal for allergy sufferers. * 20% longer suction performance. * Impact foil preventing sharp-edged objects, such as pine needles, glass and sand from penetrating the bag. * Automatic dustbag closure for hygienic removal and disposal. Package includes 4 AirClean bags, one motor filter, and one super air clean filter. Four Boxes (Packages) of 4 bags. That is 16 Bags, 4 motor filters and 4 super air clean filters. Each package includes 4 HyClean bags, one motor filter, and one super air clean filter. Free Shipping on you entire order when ordering this item.